This time, it’s an illustrated guide, so you began by making 3D models of the Pokémon. When it comes to 3D models of Pokémon - and this is going back a while - you and I worked together to establish a system for doing lots of modelling for the Pokémon Stadium8 and Pokémon Snap9 games for the Nintendo 64 system. 8Pokémon Stadium: A fighting game and illustrated guide released for the Nintendo 64 system in April 2000. With this software, players could battle Pokémon in 3D and manage Pokémon Box cartridges for the Game Boy system using the Transfer Pak. It is compatible with the , , , and games. 9Pokémon Snap: A camera-style action game released for the Nintendo 64 system in September 2000. That’s right. (laughs) We made a team at Creatures called the “Pokémon Modeling Center” and made lots of models there. 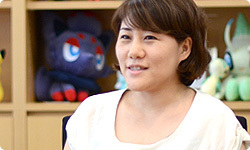 In the Nintendo 64 days, there were staff members involved with modelling Pokémon, and they participated this time, too. So when it comes to turning Pokémon into 3D, you have quite a long tradition and lots of experience, so we felt like we could just hand it off to Creatures. How many people worked on it this time? Aside from development of the illustrated guide, there were about 30 modellers, as well as 5 people in charge of motion. We had all hands on deck. When that many staff members are involved, it’s hard to pull the quality together. Especially with software like Pokémon, not only do lots of characters appear, but each player has his or her own favourites, so you can’t pour all your strength into one particular Pokémon. That’s right. We divided up the work in the art team. I didn’t instruct it, but we gave Pokémon with complicated shapes to people who were good at drawing difficult models, and we gave cute Pokémon to people who were cut out for that kind of work, doling them out according to the designers’ strengths. So at first it was important to decide who would handle which Pokémon. How did you feel with regard to making software for the Nintendo 3DS hardware? For the Nintendo 3DS system, we are able to use new graphics technology equivalent to a programmable shader10, so I think the graphics are strikingly rich. 10Programmable shader: A shader is a graphics processing circuit or program mainly for representing light and shadow in graphics. A programmable shader allows programmers to determine how they would like the effects of light and shadow to be calculated. The high degree of freedom makes a wider variety of effects possible. 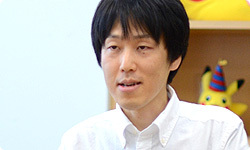 The shader in the Nintendo 3DS system is not a programmable shader, but the hardware is capable of performing the types of calculations used by a programmable shader. Another characteristic this time is self-shadowing. Could you explain to readers of “Iwata Asks” what self-shadowing is? Normally when you apply shadows in CG (computer graphics), the model casts a shadow on the floor or ground. Self-shadowing, just as its name suggests, allows models to cast shadows on themselves. For example, many Pokémon have big ears. Video: The shadows cast by a Pokémon’s ears will now fall on its back. The shadows cast by a Pokémon’s ears will now fall on its back. Shadows falling on yourself is only natural in the real world, so we hope players will pay attention to such fine detail. Yes. Shadows were also necessary in AR. By adding shadows, I think we were able to create a greater sense of reality, as if the Pokémon is right there. animation for each of the various Pokémon . I hope people will watch those from various angles, too. How did you decide on that animation? Each Pokémon has its own movement, and the Pokémon are new this time, so there wasn’t anything to use as reference, was there? But you didn’t want to do that? Each Pokémon has its own characteristics, so, without establishing any firm restraints regarding similarity, length, and so on, we asked the art team to make the data. You added the animation without making them all the same, but rather in consideration of how each of their characteristics could be made to stand out. That’s right. To make their characteristics stand out, a few ended up quite long. You want to see all the animations for the Pokémon you have collected. Yes. What’s more, when you look at the Pokédex on the lower screen, there’s text telling you everything about it - what kind of abilities that Pokémon has, what kind of moves it has learned, and how it evolved - so even if you don’t play the game, you will learn details about what Pokémon are like as living creatures. When you touch someplace you’re curious about, it jumps to even more detailed information. Yes. For example, if you touch the name of a move, you can see what kind of move it is and a list of the Pokémon who can learn it. And another feature of this software is how you can view it in six different languages! I see. So it’s convenient for people in Pokémon license management. Pokédex 3D is quite handy at work!